Everyone wish to have skin that feels fresh and rested by morning; now the wish is granted we can have that. 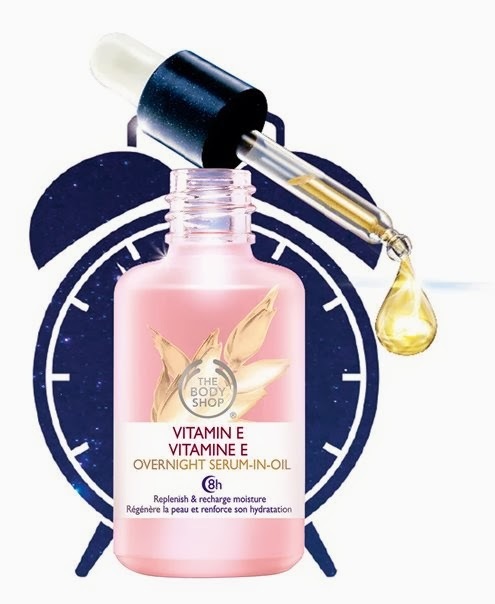 Introducing new Vitamin E Overnight Serum-in-Oil from The Body Shop combining the power of a serum with the indulgence of an oil to replenish and recharge skin with moisture overnight. Remember how it feels to get eight hours sleep? You wake beautifully refreshed and revived. Now, you can get that blissful feeling for your skin. Wheatgerm oil is one of nature’s highest sources of antioxidant Vitamin E. This formula is enriched with the highest concentration of wheatgerm oil across The Body Shop Vitamin E range, which helps enhance its emollient properties. Vitamin E Overnight Serum In Oil is a serum delivers strong skincare enhancements to a normal regime. By blending with a combination of oils, we were able to create a product that delivers greater skincare benefits with a more pleasurable and absorbing texture. This is a light, ‘breathable’ product which has been developed to avoid any potential skin interactions. It has tested very well and 70% of women said that the product is non-greasy. Plus it has been tested for use across all skin types with positive results. It leaves skin feeling more recharged, replenished and rested. A perfect combination of potent ingredients and leading skincare technology, the advanced serum blend is a light-weight and delicate oil, providing a fast-absorbing, non-greasy application. 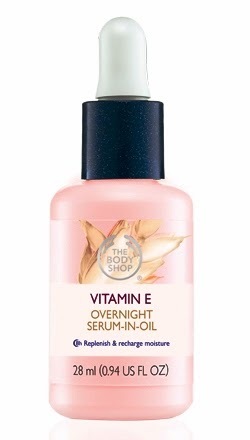 Vitamin E Overnight Serum-in-Oil is available in a 28ml bottle and is RM99.